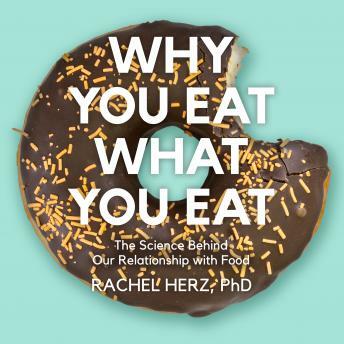 Written By: Rachel Herz, Ph.D.
Why You Eat What You Eat examines the sensory, psychological, neuroscientific, and physiological factors that influence our eating habits. Rachel Herz uncovers the fascinating and surprising facts that affect food consumption: bringing reusable bags to the grocery store encourages us to buy more treats; our beliefs about food affect the number of calories we burn; TV alters how much we eat; and what we see and hear changes how food tastes. Herz reveals useful techniques for managing cravings, such as resisting repeated trips to the buffet table, and how aromas can be used to curb overeating. Why You Eat What You Eat mixes the social with the scientific to uncover how psychology, neurology, and physiology shape our relationship with food and how food alters the relationships we have with ourselves and with one another.